In 2016 the Scottish Government consulted on whether to ban electric shock collars or not. We assumed that this would inevitably lead to a ban given the strength of the case against these devices and, critically, the fact that the Welsh Government had already gone down this route. OneKind worked hard to help make this happen, and we were deeply disappointed when it didn’t. Instead of banning shock collars, the Scottish Government chose to regulate them and since then they have been working out how to do this. Two years later and the issue is growing in profile and public concern again. In particular, the SNP MSP Ben Macpherson has launched this petition, calling on the UK and Scottish Governments to ban shock collars. It’s already got 2000 signatures, and I would strongly encourage you to sign it. It’s vital that the SNP see the strong public support out there for animal protection if they are to invest more time and effort into improving standards. If you’re in any doubt, here’s three reasons to back a ban and sign the petition. Electric shock collars are painful. Experience is the best way to learn, which is why we have a shock collar at the OneKind office that accompanies us to meetings and such like. The collar was brought off eBay for about £25. It has a shock intensity setting of 1 – 100. We’ve never used it beyond 20. To demonstrate it, we usually set it at 4 or 5. On this particular machine, this is enough to get the idea across. Here is a OneKind supporter trying the collar for the first time. The second thing to understand about the shock collar debate is that these are by no means irreplaceable tools when it comes to dog training. There are two overall approaches to dog training that are effectively diametrically opposed: reward and aversion based training. Reward-based training uses positive reinforcement such as treats and praise to encourage wanted behaviours and discourage unwanted behaviours, whilst aversion-based training uses pain or other negative stimuli to achieve the same goal. In fact, 91% of dog trainers in Scotland who responded to our survey in 2016 said that electric shock collars should be banned. Please ban the electric shock collars. They are evil and cruel. E collers are not in the correct handler cruel . Please do your homework take a look at Chris Uptons website on youtube. This guy is a full time dog trainer who i have used myself he would not use shock collars if harms the dog its all about changing the mindset of the problem dog treat training does not always work . If you dog chases sheep for example or does not come back when told. ….. you have two choices get after the dog or tap using e-coller if the dog thinks you can control him from a distance problem solved. Barbaric, disgusting and absolutely no need for this in training. A grain more than usual honesty in another manipulative article. When someone tells me that they tried an ecollar and it hurt, the first thing I ask is the make, the model and what level it was on. So far, without exception, I received an “I don’t know” answer and this is the first time that at least it’s revealed what kind of collars were used for another shot of the mass misleading of the public: as I suspected, an obsolete one and a cheap, poor quality one, both which the name “shock” collar would still be appropriate for. I’m just off the phone with PAC’s customer service, and I was told that they don’t have the collar on the picture as it’s AT LEAST 35 YEARS OLD. 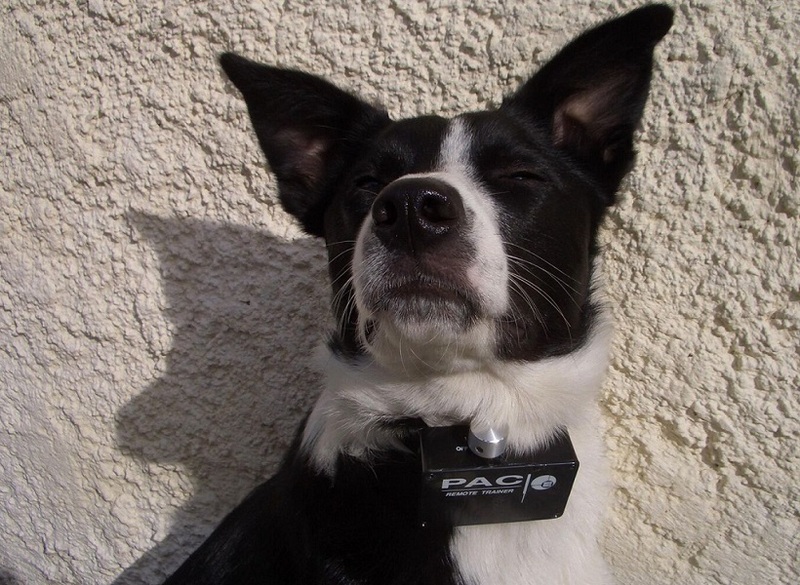 1. buy a quality collar (they are about £250). 3. STOP at the first response. If requested, I can point to videos of what that looks like both with dogs and humans, so you can decide yourself if it looks like an “aggressive training technique”. This article is wrong about even the meaning of the most basic learning theory terminology: reinforcement, by definition, cannot discourage behavior. The ignorance of the supposed “trainers” interviewed is not any less astonishing, starting with the one admittedly unsure how to correctly build association (in other words, how to train a dog). As all knowledgeable ecollar trainers know, increased aggression only happens through misuse of the tool, otherwise it leads to the exact opposite, as it’s been scientifically proven (“complete and permanent elimination of aggression in all of the 36 dogs tested”). Not to mention the question why an ecollar would be used the first place if the dog was “otherwise balanced”. Most dog trainers in the UK sell themselves by going force-free which means no training in the presence of competing motivators or against self-rewarding unwanted behaviours, for which ecollars are currently the safest, most efficient and most humane tools. The ban has nothing to do with animal welfare and has everything to do with the wish of force-free trainers to eliminate their business competition by whipping up hysteria that shows even in the first three comments here. For the third reason for the ban it being “feasible”, there’s the saying that “just because you could, doesn’t mean you should” – especially if what you’re about to do puts lives at risk. As it looks, the influx of unmanageable pets into dog shelters didn’t materialize because they simply get shot instead – as the Welsh police said, attacks on sheep “become an everyday occurrence”. Talk about reasons to back the ban. Ignorance is bliss ! yes the old style collars were bad . the new generation yes In the wrong hands can be bad but look into it please take a look at Chris Upton on youtube . It is not about hurting the dog at all, its all about changing mindset. Treat training does work up to a level but what about beyond. When the dog thinks you still have control 30 -40 meters away using an slight tap of less than half a second.